Thursday 19th March: Daily technical outlook and review. Weekly Timeframe: Following last week’s close below weekly demand at 1.0499-1.0740, the Euro recently saw active buying, which was likely stimulated from the FOMC’s latest address. Assuming that the buyers can continue supporting the market, we might, just might, see the Euro hit a major weekly swap level coming in at 1.1109. Daily Timeframe: Yesterday’s trading action saw a jaw-dropping rally of 264 pips from open to close. This recent surge violently faked above a daily decision-point supply area coming in at 1.0905-1.0821, and managed to form an overall high of 1.1036. 4hr Timeframe: Coming from the 4hr timeframe, we can see that resistive pressure begun coming into the market once price hit the 4hr decision-point supply area seen at 1.1050-1.1011. The sell off from here, as you can see, forced the Euro back down to the 1.0859 mark. Taking all of the above into account, our team is going to be watching both 1.0900 and 1.0800 today to get a feel for where the market may be headed to next. As far as we can see, a break above 1.0900 would likely open up potential trading opportunities towards 1.1000, conversely, a break below 1.0800, would likely clear the path for the market to challenge 1.0700. It will be interesting to see how this market plays out today. Weekly Timeframe: Very similar to the Euro, Cable was driven northbound following the FOMC statement, which saw price hit, and extend above a weekly Quasimodo support (now resistance) level at 1.5007. Daily Timeframe: The recent buying onslaught was, as far as we can see, supported by a daily demand area coming in at 1.4686-1.4805. Sell stops were likely flushed out as price dipped below this zone before rallying to a daily decision-point supply area seen at 1.5136-1.5020 (located just above the weekly Quasimodo level), which, as you can see, was also slightly breached. 4hr Timeframe: The 4hr timeframe shows that resistive pressure came into the market around the mid-level number 1.5150 yesterday – a clear barrier to keep in mind for the future! From here, as you can see, price sold off and closed below the psychological threshold 1.5000, which, at the time of writing, is successfully holding as resistance. Considering where the market is trading on the higher timeframes at the moment (see above), we feel that the GBP will decline in value today, and possibly into tomorrow. With that said, it appears we may has missed the boat so to speak on getting in short around 1.5000, which as a result leaves 1.4900 clearly in the limelight for the time being. Should price reach this number today, which we think it will, we intend to watch how the market reacts to this level. In the event a close lower is seen, this will, in effect, be our cue to begin watching for price to retest this level as resistance. Weekly Timeframe: The weekly timeframe shows that the buyers and sellers are currently pulling for position around the upper limits of weekly demand seen at 0.7449-0.7678. Daily Timeframe: Yesterday saw the Aussie strengthen (following the FOMC meeting) against the U.S Dollar as price was bought heavily from daily demand at 0.7449-0.7598 (located deep within the aforementioned weekly demand). 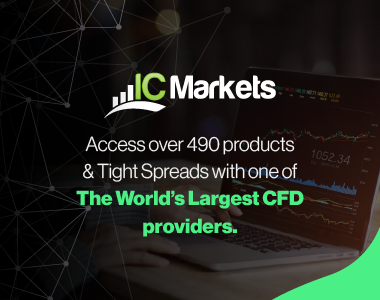 This move saw price take out the 0.7691 daily swap level, and extend up to a daily decision-point supply area coming in at 0.7859-0.7789, where, at the time of writing, selling interest is being seen. 4hr Timeframe: From the pits of the 4hr timeframe, we can see that price came within just two pips of hitting our 4hr Quasimodo support level seen at 0.7587, before the Aussie took off like a rocket! The recent ascent took out multiple technical levels and only saw resistance once price reached the 4hr Quasimodo line at 0.7843 (located deep within the aforementioned daily decision-point supply area), which, as you can see, converges beautifully with a trendline extended from the high 0.8024. At the time of writing, we can see that the sell off forced price to retest the recently broken 4hr supply area at 0.7738-0.7714. In the event that the buyers can hold out above here, this could very well attract buying into the market and see the Aussie attack 0.7843 once again. Price is trading around weekly demand (see above). Deep drive seen into the daily decision-point supply area (see above), which, in our opinion, likely suggests that the majority of sellers have been consumed. Clear space for price to move up to at least 0.7800. Buy orders: 0.7738-0.7714 [Tentative – confirmation required] (Predicative stop-loss orders seen at: 0.7710). Weekly Timeframe: The weekly timeframe shows that the USD/JPY pair recently sold off following the FOMC meeting. This move consequently forced the market down to a relatively small weekly decision-point demand area at 118.22-119.40, where supportive pressure is currently being seen. Daily Timeframe: From the daily timeframe picture, we can see that yesterday’s selling saw price spike below a small daily demand area at 119.37-119.81, which, if you look back to the weekly chart, you’ll notice is sitting right on top of the aforementioned weekly decision-point demand area. 4hr Timeframe: The 4hr timeframe shows that the recent sell off found support around a small 4hr demand area coming in at 119.06-119.27, which, as you can probably see, also converges nicely with a trendline extended from the low 116.86. From this area of demand, we can see that price was bought heavily, consequently pushing the market up to the 120.00 handle. In the event that price closes above 120.00 today, this would effectively be our cue so to speak to begin watching for the market to retest this number as support, since let’s not forget where price is located on the higher timeframes (see above) at the moment. Weekly Timeframe: The current situation on the weekly timeframe shows price sold off heavily from the weekly Quasimodo resistance level coming in at 1.2765. Assuming that the sellers can continue with this tempo, we feel there is a very good chance that price will visit the weekly swap level seen at 1.2260. Daily Timeframe: From the daily picture however, we can see that price is currently being supported by a daily demand area coming in at 1.2405-1.2517, which, in our opinion, is a key obstacle to a move towards the aforementioned weekly swap level. 4hr Timeframe: The latest coming in from the 4hr timeframe shows that price violently stabbed a 4hr area of demand seen at 1.2423-1.2480 (located within the aforementioned daily demand area). This zone held significance for us since it was where NFP buying took place at the beginning of the month, meaning any unfilled buy orders left over in this region will likely have authority. The buying seen from this 4hr zone rallied the market up to a 4hr swap area positioned at 1.2572-1.2606, where resistive selling is currently taking place. Given that price is trading within daily demand and that the overall trend is up, we’re currently watching for confirmed longs around either the 1.2500 level, or, if this handle gives way, the 4hr demand area seen below at 1.2423-1.2480 for a second retest. Buy orders: 1.2500 [Tentative – confirmation required] (Predicative stop-loss orders seen at: dependent on where one confirms this level) 1.2423-1.2480 [Tentative – confirmation required] (Predicative stop-loss orders seen at: 1.2418). Weekly Timeframe: The weekly timeframe shows that price aggressively sold off from the weekly supply area at 1.0239-1.0131, which consequently drove the market down towards the weekly swap level sitting below at 0.9663. Daily Timeframe: Yesterday’s FOMC-induced sell off cleanly took out the daily demand area seen at 0.9823-0.9873, and only found support once price reached (as mentioned above) the weekly swap level coming in at 0.9663. 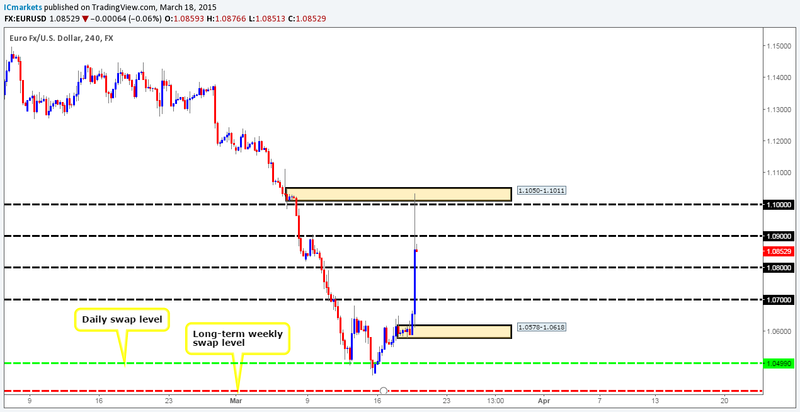 Further buying has been seen from here forcing the market to retest the recently broken daily demand area as supply. 4hr Timeframe: From the 4hr timeframe; we can see that yesterday’s onslaught faked below the aforementioned weekly swap level into a clean 4hr demand area at 0.9590-0.9636, which, as you can see, converges just beautifully with a trendline support extended from the low 0.9170. This 4hr area of demand was clearly an area of interest for buying/short-covering, as the market rebounded violently from here pushing price up to the daily swap area mentioned above at 0.9823-0.9873. Selling from this area may be an option today; however, one needs to remain aware that not only is buying pressure currently being seen from the aforementioned WEEKLY swap level, but there is a psychological number 0.9900 looming just above this zone with ‘fakeout’ written all over it. That being the case, we would strongly advise only trading here if very, and we mean VERY attractive lower timeframe price action is seen. Weekly Timeframe: Buying interest has recently been seen on the weekly timeframe coming from within a stone’s throw away from the weekly decision-point demand level at 1136.3. Again, like above, this was likely caused by the recent FOMC shenanigans seen yesterday. Daily Timeframe: The recent ascent on Gold has pushed price up to 1170.5, an ignored daily Quasimodo line. In the event that price closes above this hurdle today, this will likely clear the path for further upside towards a major daily swap level coming in at 1182.0. 4hr Timeframe: The latest coming in from the 4hr timeframe reveals price closed above the aforementioned ignored daily Quasimodo line, and, is at the time of writing, seen retesting this beauty as support. Seeing as how there is very little higher-timeframe resistance on the horizon until the 1182.0 mark, our team is very interested in entering long here. However, entering long at market may not be the best path to take since a fake lower could very well still be in store. With that said, we will only consider an entry long here with corresponding lower timeframe confirmation. Buy orders: 1175.5 [Tentative – confirmation required] (Predicative stop-loss orders seen at: dependent on where one confirms this level).